It’s fair to say there’s something of a turnover of restaurants and bars in Cardiff – indeed, I regularly find myself having conversations with people about places that go a bit like this: “It’s that place that used to be X, and before that it was Y. Now it’s Z.” So, it makes a refreshing change when somewhere has some longevity – and stays true to its original concept. This is the case with Las Iguanas, who recently celebrated a whopping 20 years at their Mill Lane, Cardiff address with a week of special events. 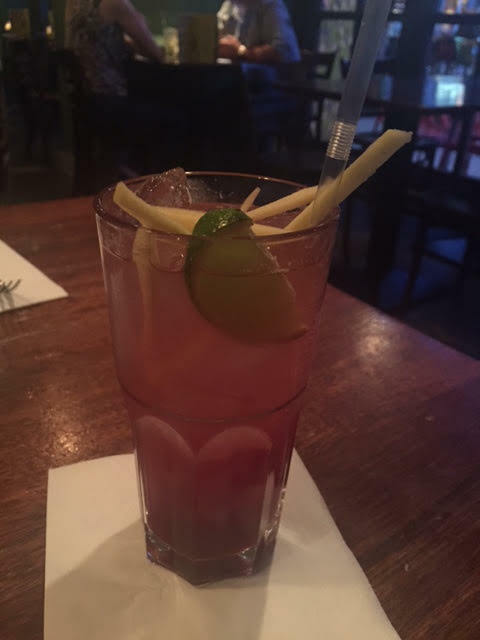 I was invited along to try the menu, and was keen to see what Las Iguanas had to offer, particularly in light of the recent competition of the very popular (although not with me) Wahaca having opened up nearby. I have to confess to some trepidation, though. Mexican food is not my favourite, and I’d been to Las Iguanas once before for a Christmas party and had a fairly awful meal. Things got off to a promising start, though, with a warm welcome at the door and a knowledgeable server who talked us through the menu, told us what wasn’t available, and made some recommendations. I was pleasantly surprised by the menu: generally, I find Mexican food extremely samey, comprising various permutations of folded tortillas with indistinguishable fillings and generic side orders. That wasn’t the case here, however. Although the ubiquitous fajitas were present (and seemed to be proving very popular with fellow diners), along with various other tortilla-based creations, there was a really good selection of different dishes, a number of which sounded very tempting, both to me, and Mr W, who actively dislikes what he views as traditional Mexican food but had been dragged along by me and instructed to bring an open mind with him! To start, a selection of tapas style dishes was on offer. 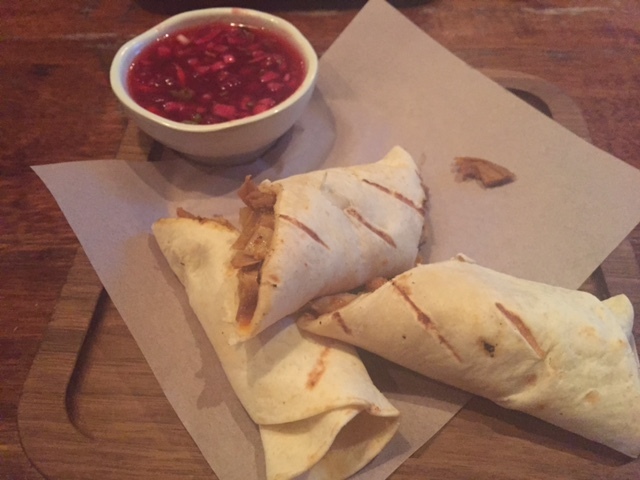 I chose a Pato Taquito, which was shreds of roast duck and caramelised onion char-grilled in a flour tortilla, with a spicy cranberry salsa. 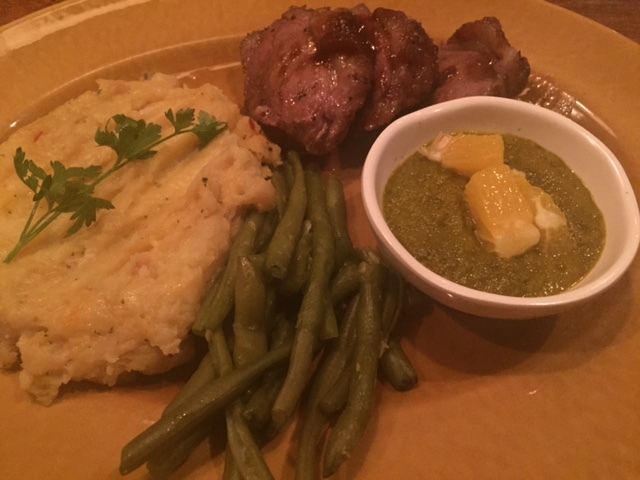 This was good in parts: overall, it was a bit greasy, and the tortilla could have been crisper, having been char-grilled, but the duck was tasty and plentiful, and the cranberry salsa helped to cut through the greasiness. I ended up just eating the duck filling and leaving most of the tortilla. 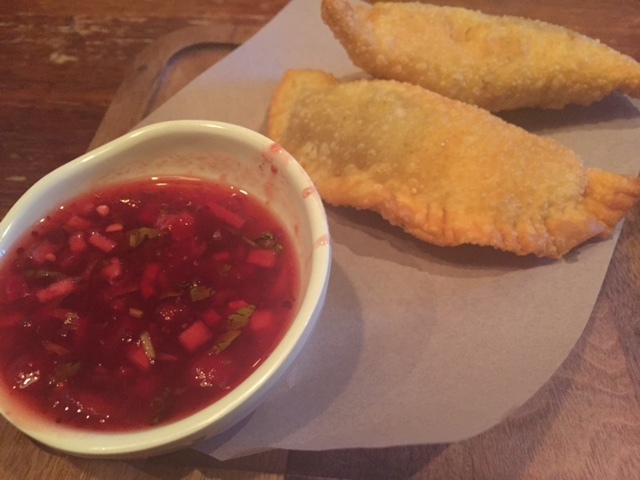 Mr W opted for Lamb Empanadas: tender lamb braised in mint, tomato and chipotle, served in a crispy pasty. This too was on the greasy side, but the lamb was absolutely delicious, again very plentiful, and the pasty was crisp too. Mr W also had some of the cranberry salsa on the side – we weren’t sure if this was meant to come with the dish, or if it was a bonus addition. Either way, it worked quite well. We both eschewed anything tortilla-based for our mains, opting instead for some more unusual dishes. I considered a fish curry which sounded tempting, but in the end plumped for Cordero: pan fried pieces of boneless lamb rack in an orange and tamarind glaze. This was served with a tangerine, chilli and herb salsa, plus garlic mash and fine green beans. The lamb was an absolute triumph: pink on the inside, with a crisp, sweet, caramelised coating from the glaze. The mash was delicious too, rich and creamy, and the salsa added a bit of bite, although there was way too much of it for me. The beans were a little bit over-cooked for my liking, but on the whole I was really pleasantly surprised by this dish and the lamb was cooked just as well as I’ve had it in some much higher end places than Las Iguanas. 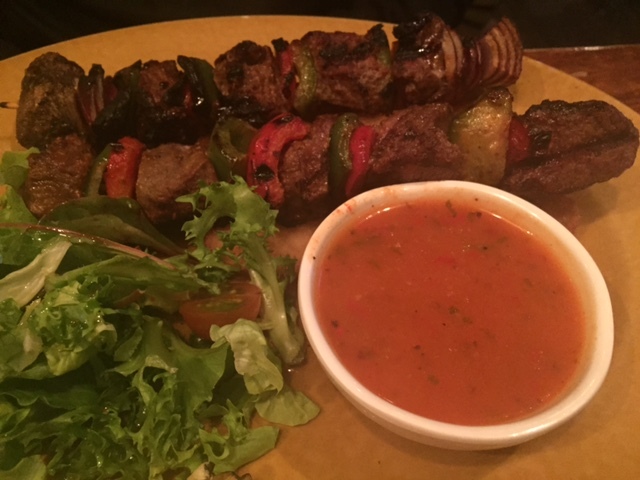 Mr W’s choice was Churrasco skewers. There were chicken and vegetable options, but he selected honey glazed fillet steak, red onion and peppers in a paprika and cumin marinade, which I had to agree sounded rather tempting. This was served with honey peri-peri sauce, salad and cassava fries, cassava being a Central and South American root vegetable. Unfortunately, the beef was extremely well done (he wasn’t given a choice of how to have it cooked) which was a shame for what seemed like good quality fillet. However, the marinade and sauce were tasty, and the cassava fries also went down well, so overall it was a good dish, despite being a bit overdone. 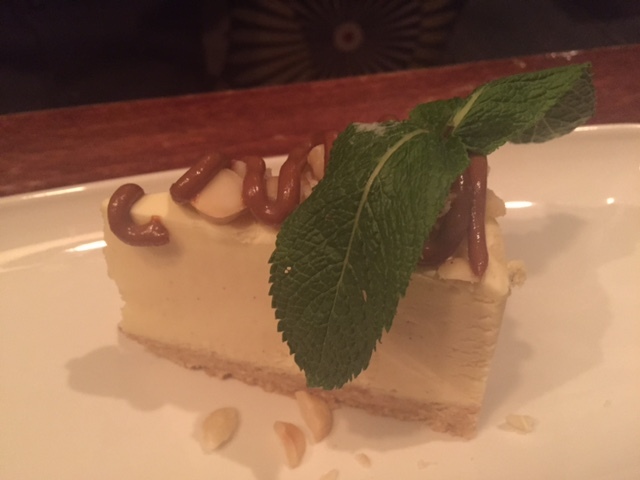 For pudding, Mr W chose a dulce de leche macadamia cheesecake. This was nicely presented, and had the unmistakeable sweet taste of dulce de leche running through a dense, baked cheesecake. Unfortunately, the base wasn’t crisp, but crunch was nevertheless provided by the macadamia nuts. I’d had an eye on the cheesecake myself, but Mr W got in first, so I took a chance and went for Tembleque, which was described as a creamy, set coconut pudding. 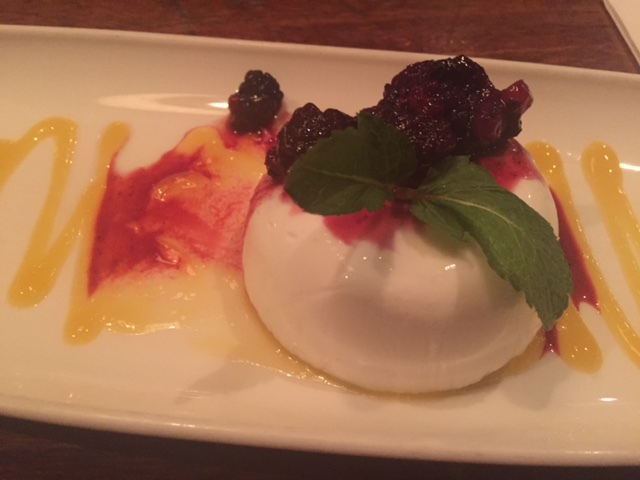 This was effectively a coconut pannacotta, which was served with mixed berries and mango puree and was an excellent end to the meal: a lovely balance of creamy coconut and refreshing, sharp fruit, combined into a very light dessert. Drinks wise, Las Iguanas has a lot to offer, with an extensive cocktail menu, and a Happy Hour where drinkers can enjoy two for one on a selection of the mixed drinks. There’s a bar downstairs should you be in the market for drinks without food, and with such a lot of tempting options on offer, this is a distinct possibility! I tried their signature Caipirinha, which didn’t last long due to mostly being crushed ice, but had a nice bite to it, and then moved on to a non-alcoholic cooler: spiced ginger punch, which was extremely tasty and refreshing. I think you can sum up our view of Las Iguanas by the phrase ‘very pleasantly surprised’. Given we’re not massive fans of either chains or Mexican food, we actually enjoyed quite a few aspects of our meal, and some of it, namely my lamb main dish and my dessert, was really very good indeed. Admittedly, we went for two of the most expensive main dishes on the menu (£16.50 each, with the average more around the £10-£12 mark) but this paid off as we seemed to be served good quality ingredients that had been prepared well (with the exception of the overdone beef fillet). 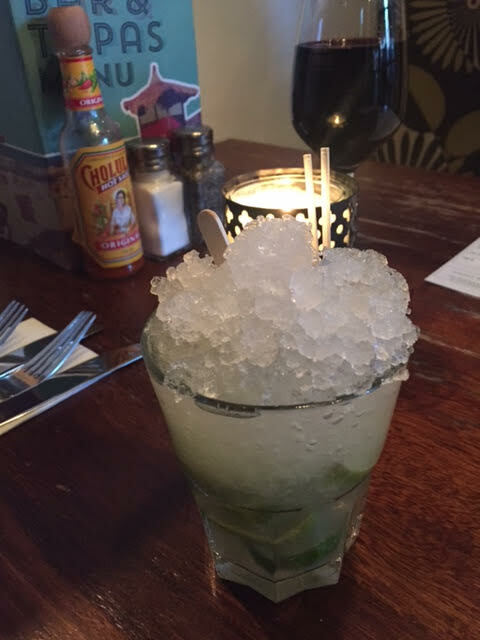 The service was excellent and the drinks creative and plentiful, so I’d definitely consider going back, and would certainly choose Las Iguanas over Wahaca as I preferred the atmosphere, which was more relaxed and intimate. Here’s to another 20 years! I was invited to Las Iguanas as a guest and as such we received a contribution of £50 towards our food and drink.